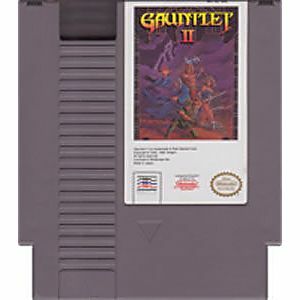 Gauntlet 2 original NES Nintendo Game cartridge only - Cleaned Tested and Guaranteed to Work! A great classic game that you can spend hours and hours playing and exploring. The game keeps you hooked. Decent graphics, great title screen (except the ugliest female face ever for the Valkyrie). Deaths are still as spooky as ever ! Fun game. Received promptly and in working condition. Appearance was exceptional considering the age. A Classic 4 Player Action Game Ever Made. This Game Never Get's Old. Brings Back Lots Of Memories. The game itself gets old pretty quickly when you play solo. With a friend it really is more fun. The game is challenging and while the game isn't all that great, it still is worth the cheap price. 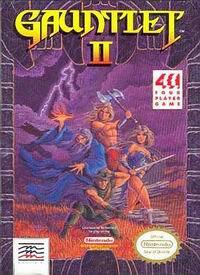 Gauntlet 2 is an action game by Mindscape. 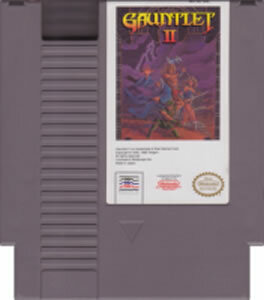 Gauntlet 2 feels a lot like the original, but has a few minor tweaks. Gauntlet is one of the few 4 player games on the system, but if you manage to make this happen, it can be a lot of fun. Aside from this however, the game isn't all too great. 3 stars just for good multiplayer! This game is quite fun but it's really not meant to be played alone. Get yourself a four score or satellite, invite over three friends and have a blast! This game is one of the funnest multiplayer games on the system!